With a history stretching back nearly a millennium, Cantonese opera is a uniquely rich contributor to the cultural heritage of the region. This ancient art form is being given a new platform, thanks to the recent opening of the Xiqu Centre – the first major performing arts venue in the West Kowloon Cultural District – dedicated to showcasing the finest in Cantonese opera and other forms of traditional Chinese theatre arts. But what you might not realise is the Xiqu Centre also provides a chance to combine appreciation of the art form’s best-known works with another of this region’s greatest treasures: its tea culture. In an environment that recreates the warm, welcoming atmosphere of Hong Kong’s early 20th century tea houses, visitors the Tea House Theatre can watch a programme of excerpts introducing a range of vocal and music styles, and accompanied by tea and dim sum. 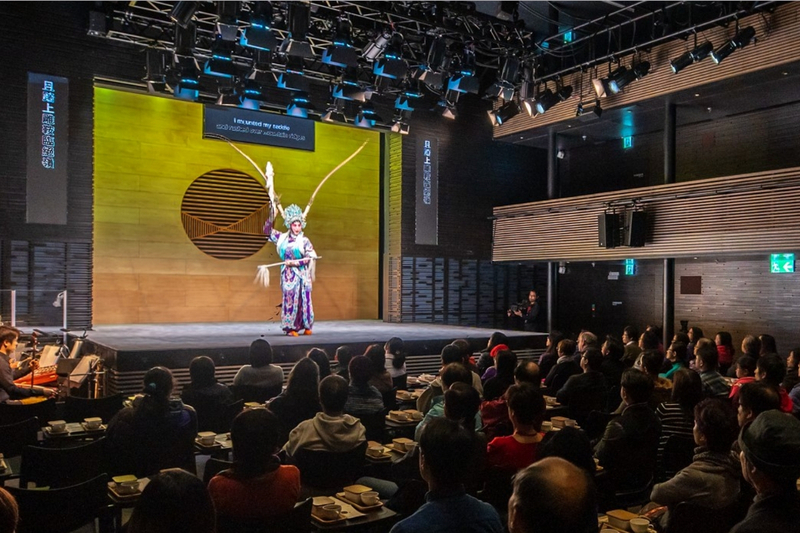 The 90-minute programme is ideal for those who are new to Cantonese opera as well as for those who would like to know more about its range and history. It includes narration by an expert moderator, with both performance and narration in Cantonese with Chinese and English subtitles. It is performed by the Xiqu Centre’s very own Tea House Rising Stars Troupe, which features a host of the city’s finest young opera talents including young musicians and actors. The troupe is led by the legendary Dr Law Kar-ying, who made his name in Cantonese opera before acting in numerous much-loved local movies, and received the Medal of Honour from the Hong Kong SAR government in 2012 for his services to Cantonese opera. For those who want to explore the world of Cantonese opera further, the 60-minute Xiqu Centre Guided Tours, in Cantonese, Putonghua and English, offer the perfect chance to discover more about the architecture and design of the new venue, as well as about the culture and history of the art form. Tours take place every Tuesday, Thursday and Saturday at 11.30am, and Sunday at 5pm, and cost HK$100 or HK$50 with a HKID card. The Tea House Theatre performance, meanwhile, is available every Wednesday to Sunday at 7.30pm and also on Saturdays and Sundays at 3pm, priced at HK$318 and HK$368. This story is presented by the Xiqu Centre, West Kowloon.